PALMDALE, Calif. -- A teenage girl and a 54-year-old man were killed in a high-speed crash after their vehicle split in two on impact in Palmdale. The deceased were identified as father and daughter, family members told Eyewitness News. Palmdale sheriff's officials responded to the scene of the single-vehicle collision on 25th Street East and Joshua Hills Drive shortly before 6:30 p.m. Sunday, according to the Los Angeles County Sheriff's Department. The 2014 Chevy Camaro was seen split in two at the intersection. Sheriff's officials said the bright yellow car was traveling at a high rate of speed on southbound 25th Street East when it lost control and hit a traffic signal. The impact sheared the Camaro in half and left the car in pieces. The 54-year-old man and the 17-year-old girl inside were pronounced dead at the scene. Their identities were not yet released by officials, but family members identified them as Vanessa and Manny Paniagua. 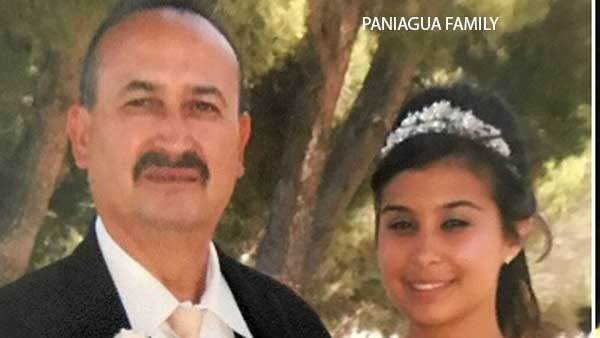 Family members identified the victims of a deadly crash in Palmdale as Vanessa and Manny Paniagua. Family members said the father and daughter were returning home from dinner. The crash happened less than a mile away from their home. "It's never easy losing a family member. When it comes to two people it's even worse," Martha Castro, sister and aunt to the victims said. Manny Paniagua had a wife and six children, and according to his family, Vanessa was the youngest of the children. Manny Paniagua would have turned 55 years old on Valentine's Day, his family said. "Dad always knew what to say. Whether you needed help or advice, (he was) always there," Giovanni Paniagua, son and brother to the victims said. "My sister just (had) the biggest heart." Witnesses said the car appeared to be involved in a street race when the crash occurred, but authorities had not confirmed the account of the witnesses. Officials said they were still investigating the cause of the collision. Family members said they were not sure if the father and daughter were racing someone, but if they were, they asked that anyone who was involved to please come forward. "I'm not blaming that person. Everyone makes their own decision and their own choices. If it was a race, he didn't have to," Castro said. Anyone with information was urged to contact the Palmdale Station Traffic Department at (661) 272-2400. A GoFundMe page was set up to help the Paniagua family with funeral costs.